Much like the apple, banana, guava, mango and several other fruits that go into our jucies, the grapes used for Minute Maid Colour are also 100% sourced from local farms. 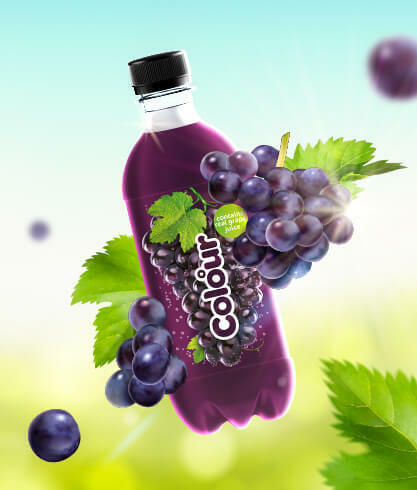 The name is inspired by the people of Tamil Nadu, who refer to a soft drink as ‘Colour’. The beverage was developed specifically for the state’s markets where the flavour has strong roots. 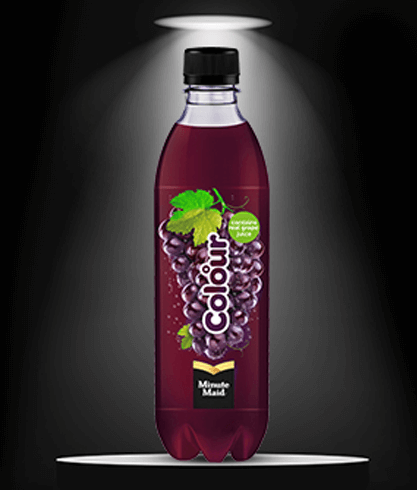 A fast-moving flavour in fruit juice stalls, it was a clear choice to go ahead with the manufacture of the drink. It will soon be distributed to the most rural reaches of the state, reiterating our commitment to go hyper local. ‘Colour’ is produced at our Nemam factory near Chennai. A journey that spans more than a decade is often taken in small steps. But for Krishna Veni, each one of those small steps were giant leaps. 15 years ago, Krishna Veni, an ITI graduate, joined HCCB as a final line inspector on contract. 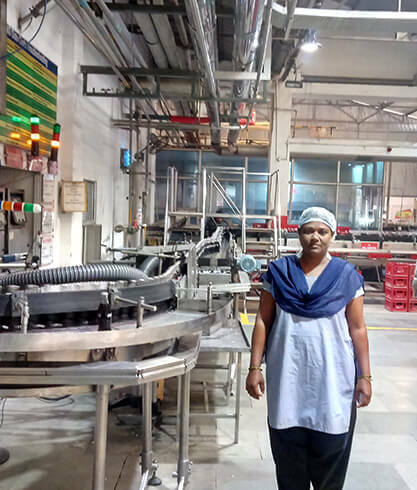 However, the dedication and passion she brought consistently to the factory floor saw her being chosen as an associate of the company. Something that did not make any difference to her work ethic. “I have always thought of myself as a part of the HCCB family, from the very first day.” Krishna Veni reminisces. Ever since then, she has been a source of inspiration for the 8000-strong family of HCCB, and all the women who work here. 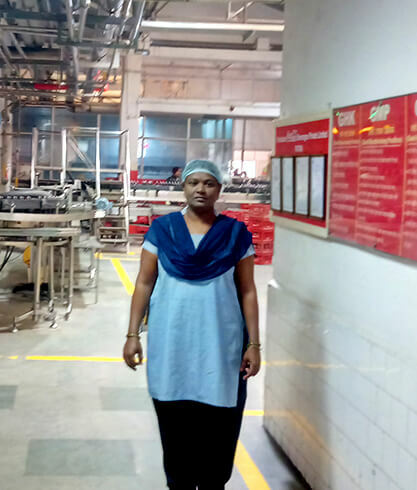 Moving recently to work at the HCCB factory in Patna, she settled in quite easily into her new role, unnerved by the change in location. She continued to bring in the same dedication to her job that she had displayed since day one. Something that did not go unnoticed by the ones around her, as she was recently felicitated at an event organised for outstanding operators in the workforce. The sense of achievement on her face as she walked up to receive the award was evident. For her, this was much more than just an award. It was a reminder of the 15 years of relentless passion and perseverance that she brought to her job every day. Today as HCCB rewards her for her outstanding contribution, it is also a fitting tribute to the passion and fighting spirit she has been carrying with her for the past one and a half decades. “15 years ago, feels just like yesterday,” says Krishna Veni. So, for every one of those 15 years, and for every day of the next 15, gracias Krishna Veni! 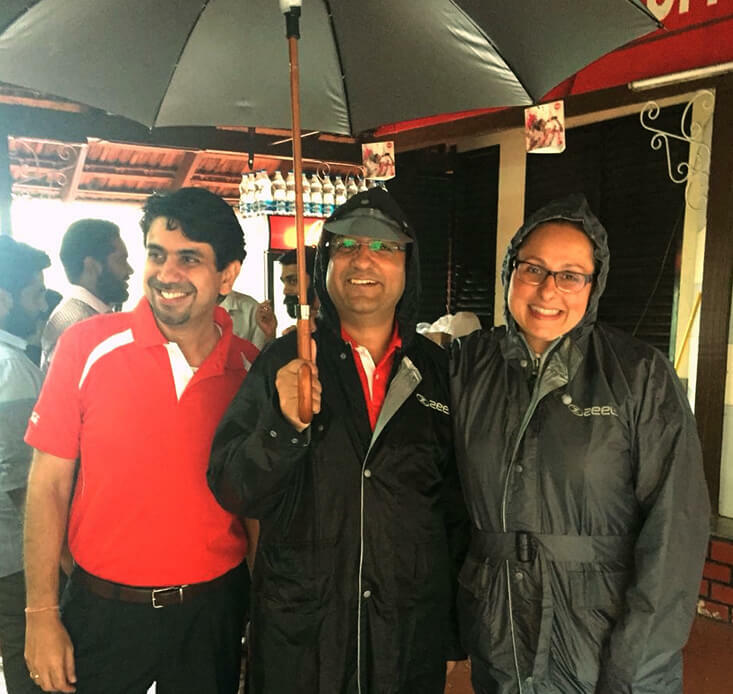 April 10, 2019 Bidadi: Marcelo Boffi, President, Bottling Investments Group, The Coca-Cola Company, and his senior leadership team were on a visit to Bidadi and Bengaluru this week. Marcelo and his team are in-charge of the bottling and manufacturing operations of The Coca-Cola Company, globally, which includes the operations of HCCB (Hindustan Coca-Cola Beverages Pvt Ltd) in India. HCCB is one of India’s largest FMCG companies, headquartered in Bengaluru. 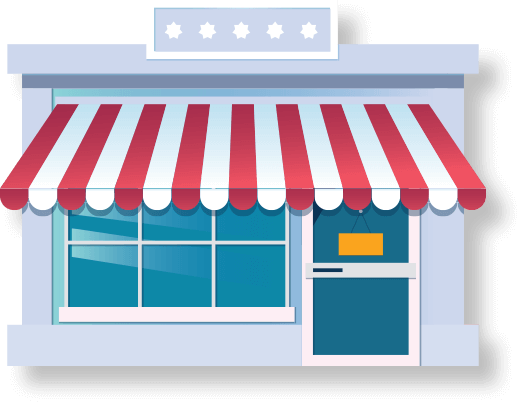 It manufactures and sells a range of juices, dairy products, packaged water, carbonated beverages and other hydration products. Christina Ruggiero, CEO, HCCB and her senior leadership team in Bengaluru, hosted the visiting team. On their visit to the two factories in Bidadi, the respective factory Managers, Bheemannappa Manthale and G Ganesh gave them a guided tour of the factories. The team also interacted with village elders and the community members at Medanahalli, where they saw a community RO system in operation. This RO system installed by HCCB, helps the community member procure 20 litres of water for Rs. 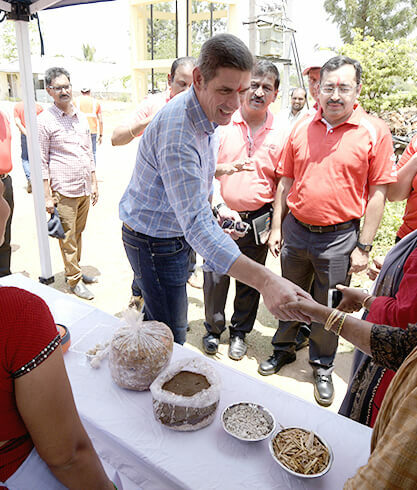 5/- They also met members of the Self Help Groups, who have taken help from HCCB to now produce and market 40,000 papads in 6 months. The team also reviewed the progress of another SHG, which is into mushroom cultivation and has already earned Rs. 20,000 producing 115 KGs, within the first 6 months. Marcelo also met farmers who have taken help from HCCB and the local Krishi Vigyan Kendra for improving agri yield and cattle productivity. Umesh Malik, Chandrasekhar, Dhananjay and Damodar, from HCCB facilitated the interactions. HCCB has implemented the HCCB Model village project at Medanahalli, which facilitates education, drinking water facility, livelihood, sanitation, among others, for the local community. At the Bidadi factory, the team from The Coca-Cola Company saw the manufacturing line, which is the country’s only line that manufactures SmartWater. 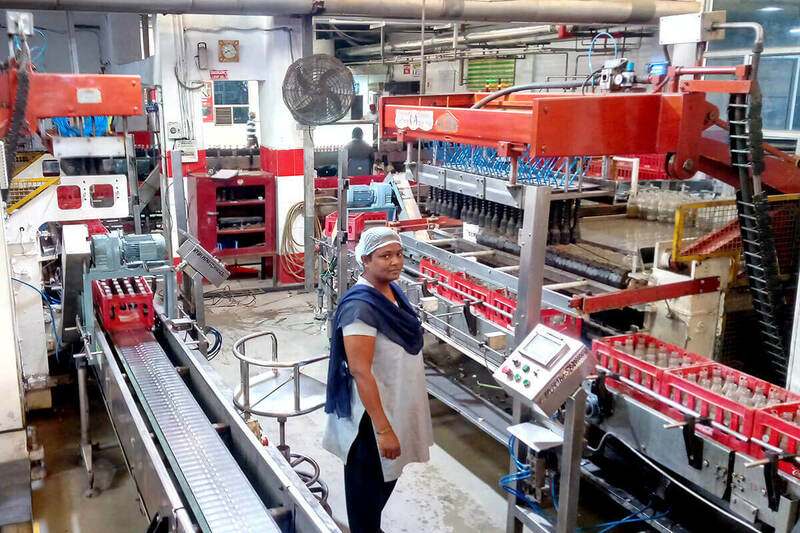 At the second factory, they witnessed the functioning of a manufacturing line, which is capable of producing juice, with carbonation in it. They also reviewed the solar energy and CNG usage interventions at both the factories. Both the factories use in excess of 70% green and clean energy, to run their operations. They also interacted with the HCCB employees at both the factories. HCCB is one of India’s largest FMCG companies. 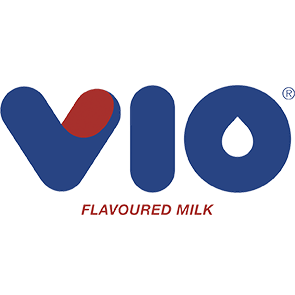 It manufactures, packages and sells, some of India’s most loved beverages – Minute Maid, Maaza, SmartWater, Kinley, Thums Up, Sprite, Coca-Cola, Limca, Fanta, Georgia and several others. 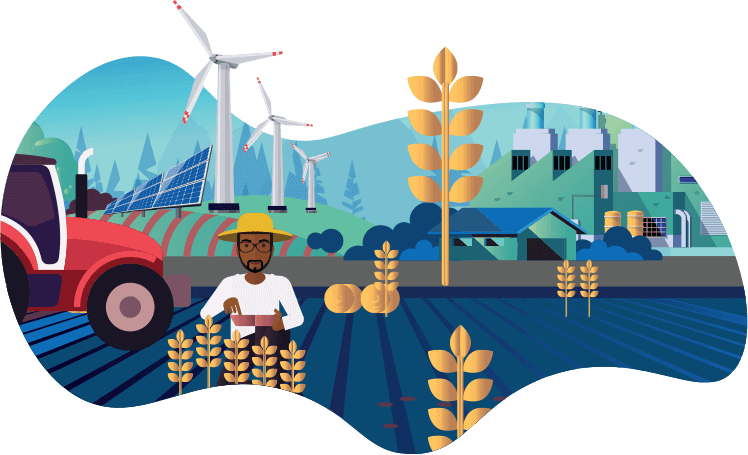 A network of 3,900 distributors, 250,000 farmers, 7,000 suppliers and over 2 million retail outlets, makes HCCB, an ecosystem of significant scale. It operates in 25 states in 493 districts. Through its 18 factories, HCCB manufactures and sells 55 different products in 9 different categories. HCCB had a lot to celebrate at the recently held edition of India Legal Awards 2018. On the day, the HCCB Legal Team won the prestigious ‘Legal Team of the Year’ award. HCCB competed with several other in-house legal teams to win the award in the category. The teams were evaluated by the jury panel on the basis of seven criteria. The jury panel consisted of legal luminaries including Soli Sorabjee (Honorary Member of the Order of Australia and former Attorney General of India), Tushar Mehta (Solicitor General of India), Lalit Bhasin (President, Society of Indian Law Firms) and Mahaveer Singhvi (Joint Secretary, Ministry of External Affairs, Government of India). 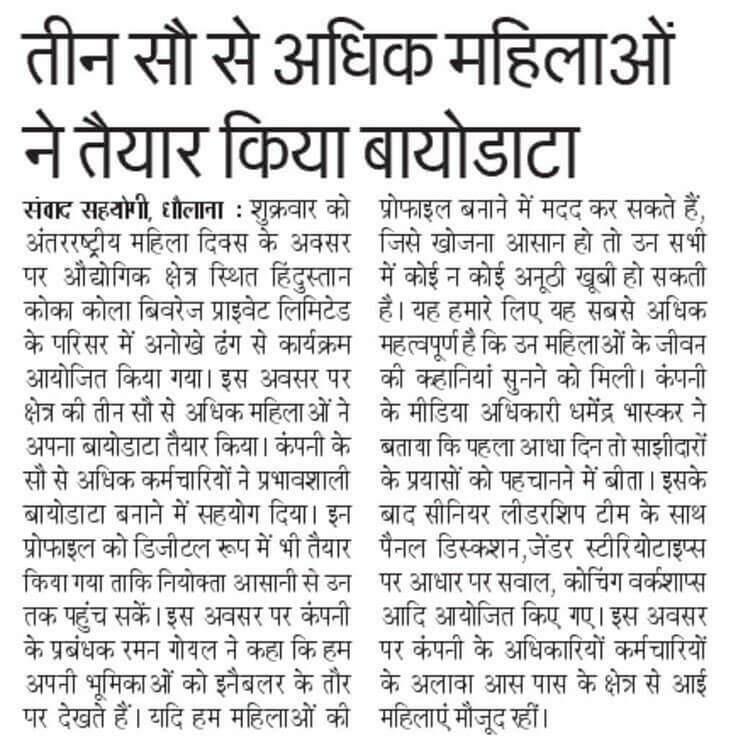 In an initiative to support our SHG (Self Help Group) members in generating more income through various business ventures, HCCB organized EDP (Entrepreneurship Development Program) training in Bidadi recently. 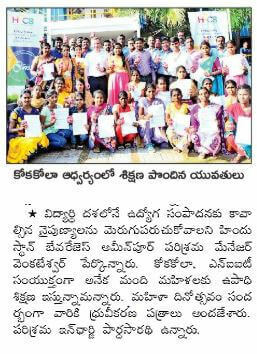 HCCB joined hands with CEDOK (Centre for Entrepreneurship Development of Karnataka) for 30 SHG members from Jogardoddi, Byravanadoddi, Abbanakuppe and Medanahalli. During the session, the participants were given insights on the skills required to become an entrepreneur and were also informed about schemes available in various departments to start their businesses. HCCB has supported SHGs in various initiatives such as Papad Making, Mushroom Cultivation, and Candle Packing. 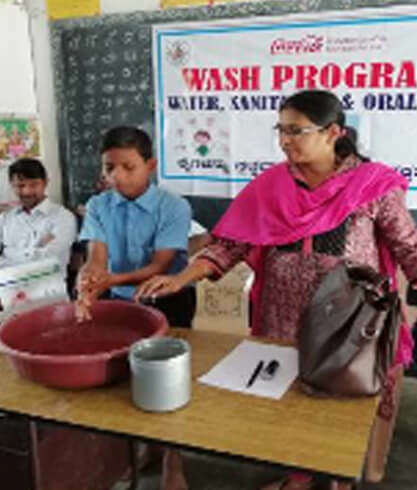 To drive awareness among the school children in the area of hygiene, HCCB also organized WaSH, a program to inculcate the habit of having clean and hygienic hands in the Abbanakuppe colony primary school for both Primary and High School. Leading the session, Dr Savitha educated the students on hand and oral hygiene, explaining the importance of maintaining hygiene and why it is essential. Post the session, an oral check was conducted for 70 children. 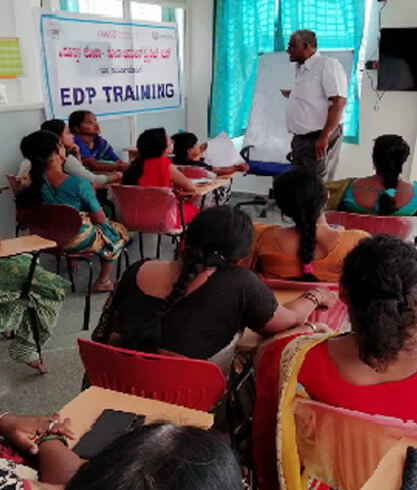 In an initiative to support our SHG (Self Help Group) members in generating more income through various business ventures, HCCB organized EDP (Entrepreneurship Development Program) training in Bidadi recently. 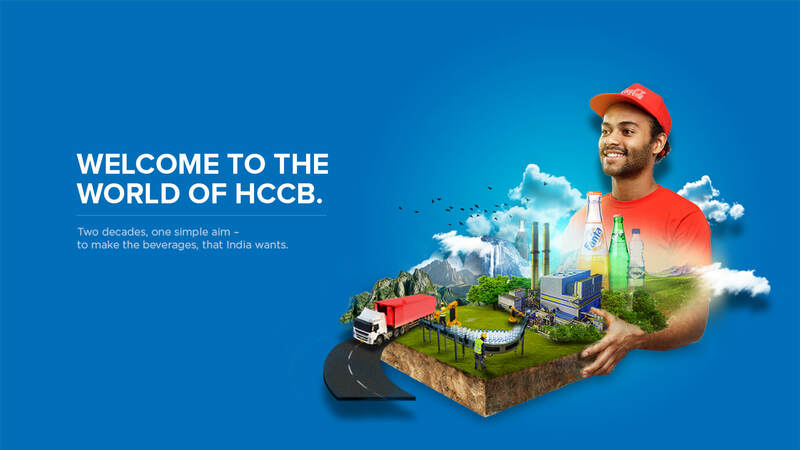 Welcome to the world of HCCB – a company that started in 1997 with the simple aim of making beverages for the India of the 21st century. Two decades later, we are among the top 10 FMCG companies in India. While we have grown in scale, our soul remains unchanged. We still find our answers in the questions of India; we continue to find our ink in the stories of India. We are driven by India’s hopes; we are fuelled by India’s dreams. 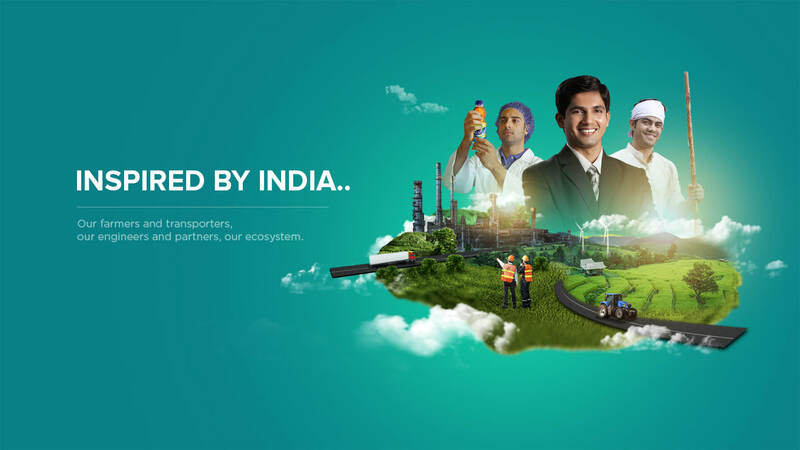 Come explore the world of HCCB – a company #inspiredbyIndia. For more information about the product and its ingredients, visit the Coca-Cola India website. Welcome to the HCCB family, where possibilities and happiness are endless. Thinking of taking a ride in an HCCB truck? Come, join us. The journey has just begun. They keep seeking, never settle. They push for progress. When Hindustan Coca-Cola Beverages was challenged with keeping smaller-sized products fresh and affordable, the innovators with the Company (HCCB) created what may possibly be the lightest bottle in the world for fully carbonated products. , The “Affordable Small Sparkling Package"? (ASSP). It is a 250 ml PET bottle that maintains aesthetic appeal and the imperative product quality protections, needed for bottles to travel long distances to reach consumers in rural areas and often-extreme tropical temperatures. It is also helping the company reduce its carbon footprint. 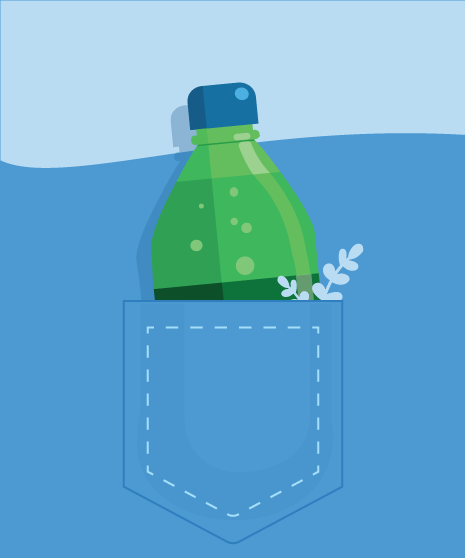 The ‘affordable’ part of the bottle’s name relates to a historic hindrance: The product cost of bottles made specifically to reduce carbonation loss, typically increases because an increased amount of plastic is required to bolster the inner walls of the bottle walls. This is neither environment friendly not cost wise. So HCCB took a new approach to deliver a high performing, lower-cost bottle that also used lesser PET resin. The ASSP, which was introduced in 2016 and weighs less than 10 grams, took nearly two years to create. Proprietary Coca-Cola computer simulation methods were used to design the package using one-third less plastic than a standard plastic bottle in India (wt 15.5 gm) and an incredibly thin barrier layer was added to the bottle walls to prevent carbonation from escaping. When combined, these two advances extend product shelf life by a remarkable five months or more. This innovative technology can be used to reduce plastic usage in the production of plastic bottles for sparkling products up to 40 percent as compared to a the production of a standard plastic bottle, in some cases. 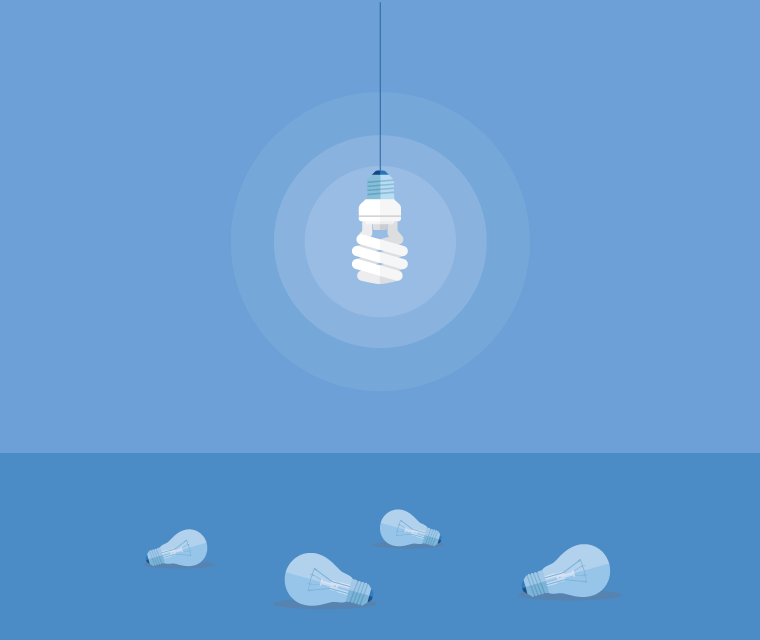 The improved design does not compromise recyclability. 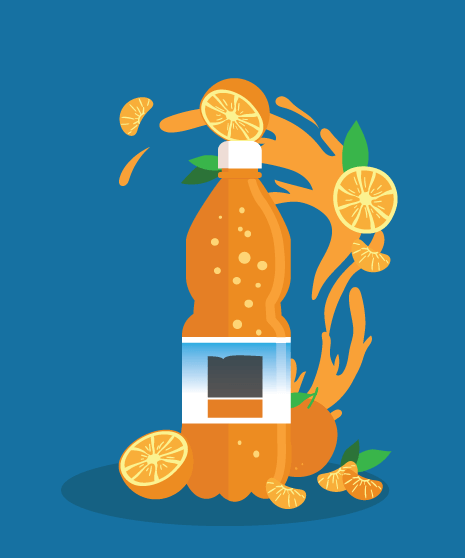 Day in and day out, beverage manufacturers face the challenge of preserving the freshness of their products, from the moment it leaves the factory, till the time it reaches the hands of the consumer. Considering the varying temperature and climate between different states in India, you cannot trust the weather to be your friend. Extreme and varying weather conditions can often take the zing (carbon dioxide) out of your beverage. Well, not anymore. HCCB has developed a heat-resistant tarpaulin that is used for covering its products during transportation through trucks from one region to another. The new heat resistant tarpaulin insulates the product from extreme temperatures, while also keeping it safe from dust, water and sunlight. 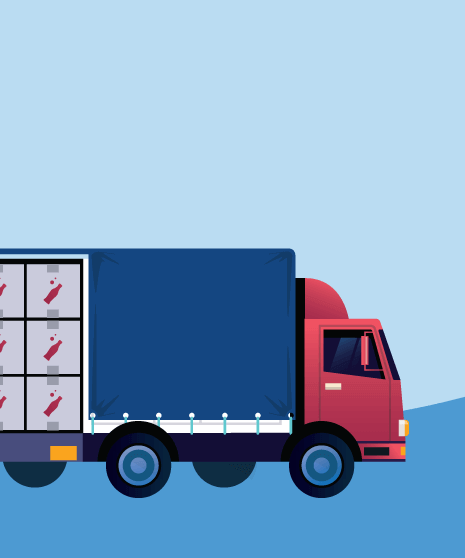 With the ability to maintain the temperature of the shipment at 5-6 degrees below ambient temperature, HCCB beverages can now travel the length and breadth of India without losing its freshness, one wee bit. HCCB has also bagged The Worldstar 2018 Award instituted by the World Packaging Organization for this innovation. For a decade now, orange lovers of the country have enjoyed the delightfully natural, juicy and pulpy taste of Minute Maid. 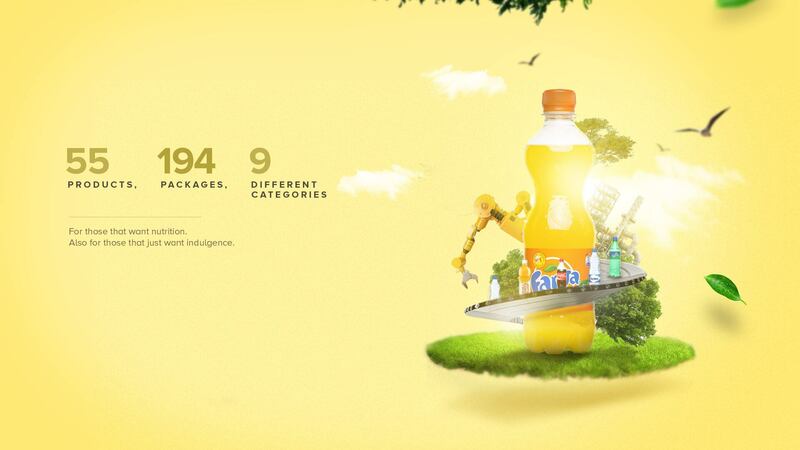 And there is a lot that goes into maintaining this amazing taste and consistency in all Minute Maid bottles. Here is how HCCB innovated our manufacturing processes and bottling lines to bring about the taste and texture of Minute Maid Pulpy Orange. It all begins with the concentrated juice and sacks prepared from fresh oranges. They are supplied separately, in hygienically packed frozen form, (at -18 degree Celsius) to maintain quality and freshness while in transit; and to prevent any external contamination. The frozen juice and sacks are then made to undergo ambient thawing in a hygienic environment inside the Factory. The juice and the sacks are then blended to get the pulpy juice concentrate. After thawing, the concentrated juice and sacks are taken to a beverage-blending tank where a specially designed agitator ensures the intactness and consistency of orange pulp. The agitator in the factory also prevents the pulp from settling down. During these processes, the pulpy juice concentrate is effectively blended with sugar syrup and water in the same tank. This makes the blended beverage ready with right proportions of juice and pulp. A positive displacement pump transfers this blended beverage to the bottling line. The pump also ensures that the orange pulp remains intact through the process lines. The beverage is then passed through a pasteuriser, which is heated up to 96 degree Celsius to ensure its safety, until the product reaches the consumer. The pasteurised beverage is then filled in bottles maintaining its pulpy consistency in every bottle. Next, the bottles are cooled down to room temperature for further secondary packing and distribution. The beverage is then subjected to a series of quality checks before and after it is packed into the bottles. The formulation of the output ensures that on shaking the bottle once, the pulp remains in suspension and takes time to settle again, thus giving you the pulpy experience in every sip! Curious, empowered, inclusive and progress over perfection — these tenets guide the many innovations which our people are able to see through at HCCB. They want us to help find solutions and make a measurable and meaningful difference in the world. 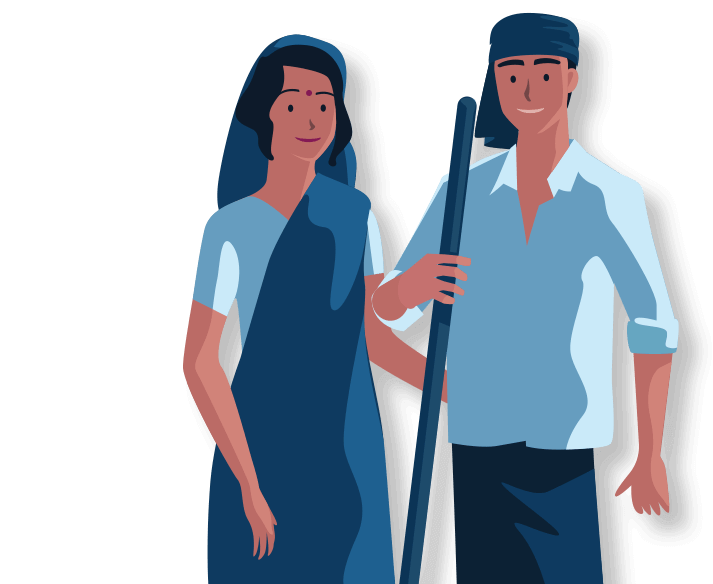 We are happy that communities and civil society are seeing value in what we bring to the table - our expertise - our know-how - our unique and specific strengths. Leaders spend time with the community in Medanahalli village. 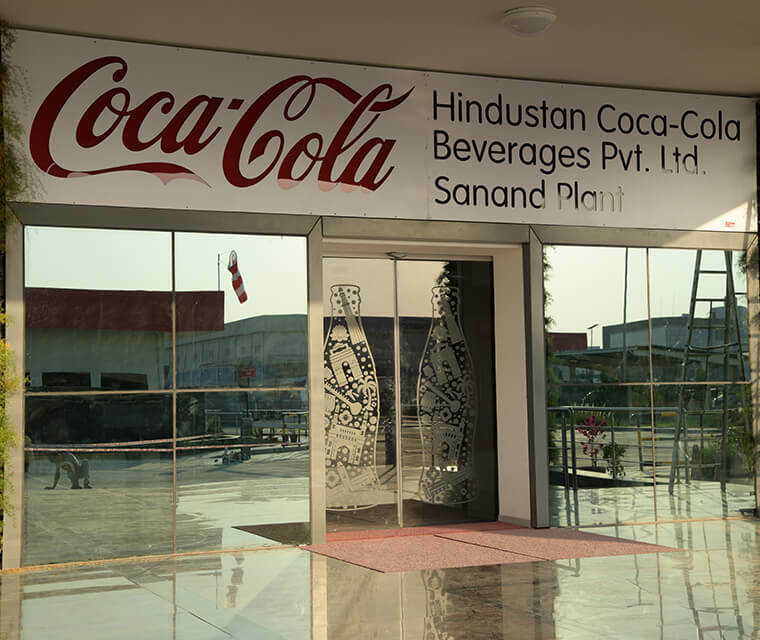 Ahmedabad, April 4, 2019: HCCB (Hindustan Coca-Cola Beverages Pvt Ltd) – one of India’s largest FMCG companies – today announced that the Indian Green Building Council (IGBC) has awarded the Gold certificate to its newest factory at Sanand, Gujarat. The factory - a fully digital and world-class facility, became operational in mid-2018. The Sanand factory is only 1 of 9 Gold certified Green Buildings (Factories) amongst the FMCG / Food industrial facilities in India. It is also the only factory run by HCCB, which employs more than 40% women. 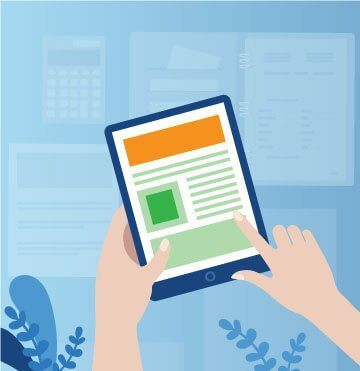 Green buildings are defined as “one which uses less water, optimizes energy efficiency, conserves natural resources, generates less waste, and provides healthier spaces for occupants, as compared to conventional buildings”. The Gold certification to the Sanand factory is based on an assessment of the site in the categories of sustainable site, water conservation, energy conservation, indoor environmental quality, material conservation and innovation. Initiatives such as prevention of soil erosion, group transportation and shuttle services, on site solar power generation & effective usage, rainwater harvesting, re-use of wastewater, vehicle charging facility, and several others, have been undertaken at Sanand to develop it into a green site. 1. Soil erosion prevention and controls, maintained during the project phase. 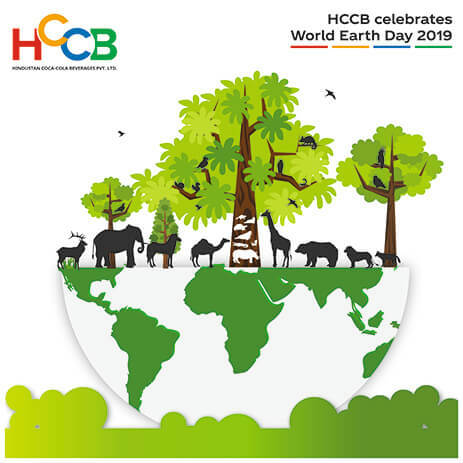 Bengaluru, Karnataka, March 27, 2019: HCCB (Hindustan Coca-Cola Beverages (HCCB) Pvt Ltd) – one amongst India’s top FMCG companies – has entered the list of elite, global, manufacturing organizations. 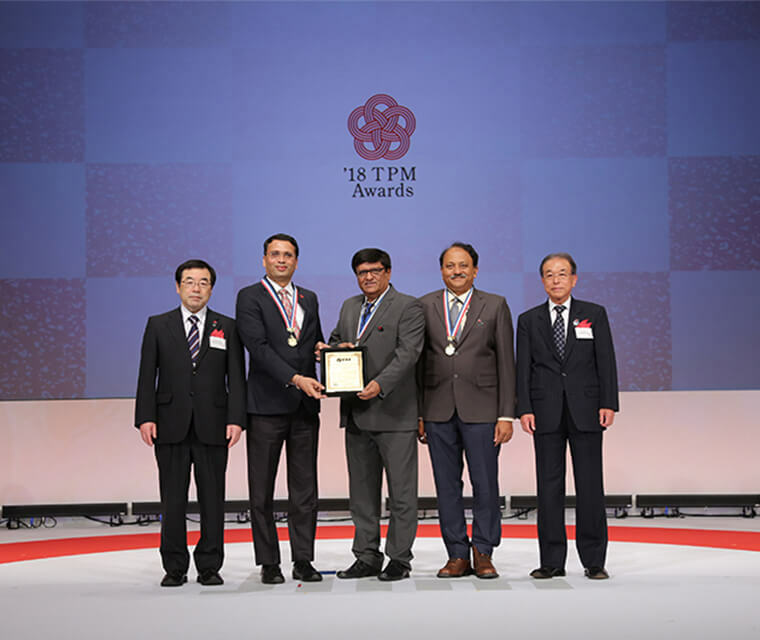 Two of its factories, one each at Ameenpur (near Hyderabad city) and Pirangut, Pune have been conferred the prestigious JIPM (Japan Institute of Plant Maintenance) Excellence in Consistent TPM (Total Productive Maintenance) Commitment Award. The award was handed over to factory managers G. Venkateswara Rao and Kedar Sapre for Ameenpur and Pirangut respectively, at a glittering ceremony in Kyoto, Japan. 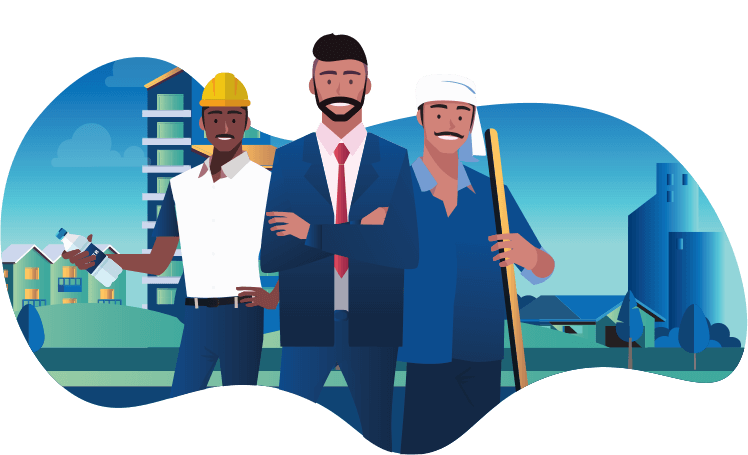 JIPM is one of the elite institutions in the world, which promotes safe, secure and reliable, production and maintenance activities in global manufacturing set-ups. Since its institution in 1964, it has also presented the TPM Excellence Awards, and so far, only 3000+ plants in the world have received this award. Among the 21 plants globally, that have been conferred the JIPM Excellence in Consistent TPM Commitment award, in 2018, there are 11 Indian Plants, 2 of which are the HCCB factories at Pirangut and Ameenpur. TPM was introduced by the Japan Institute of Plant Maintenance (JIPM) in 1971 and is defined as the ultimate method of pursuing production efficiency. 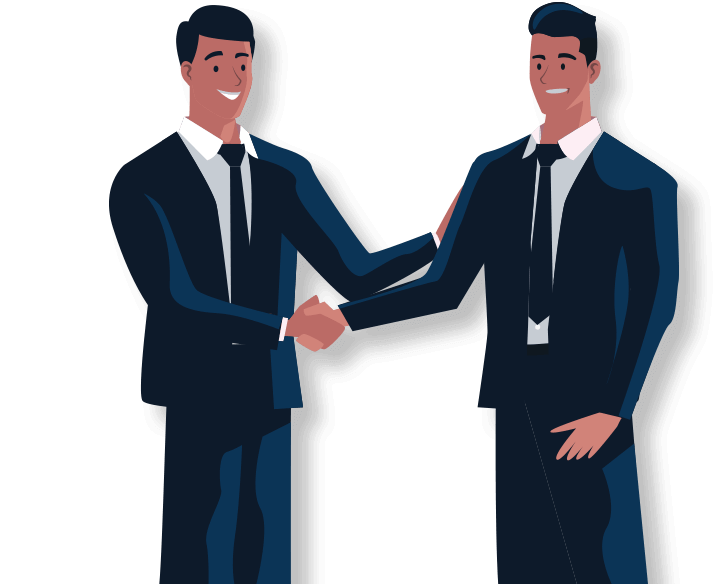 It is intended to encompass the entire company from the shopfloor to the executive boardroom, creating a true company-wide commitment to production excellence, and is designed to avoid any losses by creating a culture of 'zero accidents, zero defects and zero breakdowns’. The JIPM award system judges the results of a plant’s activities and presents awards at five progressive levels: Excellence, Consistency, Special, Advanced Special and World Class. On average, it takes about 10 years for a plant to go from the first to the highest level. The auditors of the award review every facet of manufacturing and its contribution and therefore the impact to the overall business. Hindustan Coca-Cola Beverages Pvt. Ltd is one of India’s largest FMCG companies. 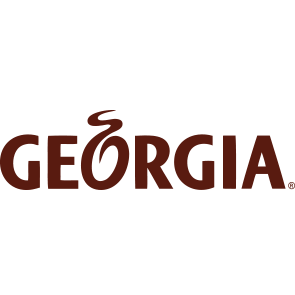 It is responsible for the manufacture, package, sale, and distribution of some of India’s most loved beverages – Minute Maid, Maaza, SmartWater, Kinley, Thums Up, Sprite, Coca-Cola, Georgia and several others. A network of 3,900 distributors, 250,000 farmers, 7,000 suppliers and over 2 million retail outlets distribute the high quality, great tasting beverages manufactured by HCCB. It operates in 25 states in 493 districts. With 18 factories, HCCB manufactures and sells 55 + products in 9 different categories. 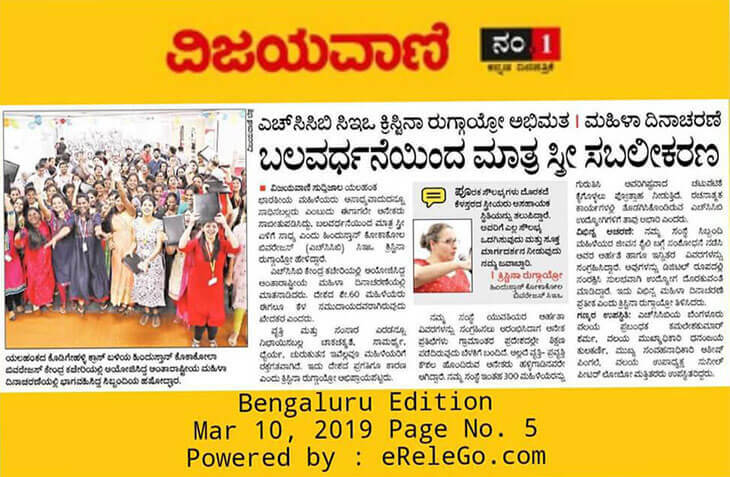 Bengaluru, March 8, 2019: Hindustan Coca-Cola Beverages (HCCB) Pvt. Ltd. today celebrated International Women’s Day (IWD) unlike any other. The Company did not offer flowers and gifts, or gave cards. 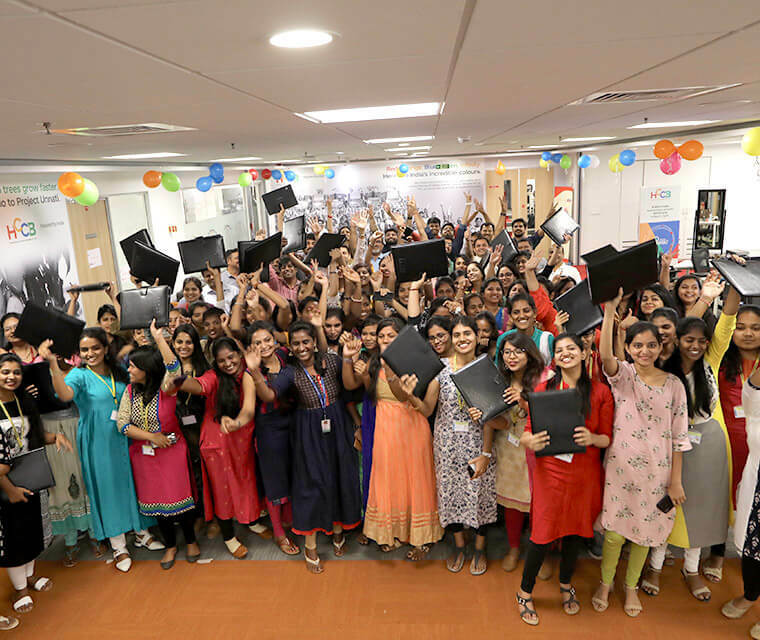 Instead, 100 HCCB associates across India joined hands to spend quality time with 300 women from the local community, to understand the journey of their life, and create an impactful resume for them. The HCCB team also made these profiles digitally available for easy accessibility by potential employers. 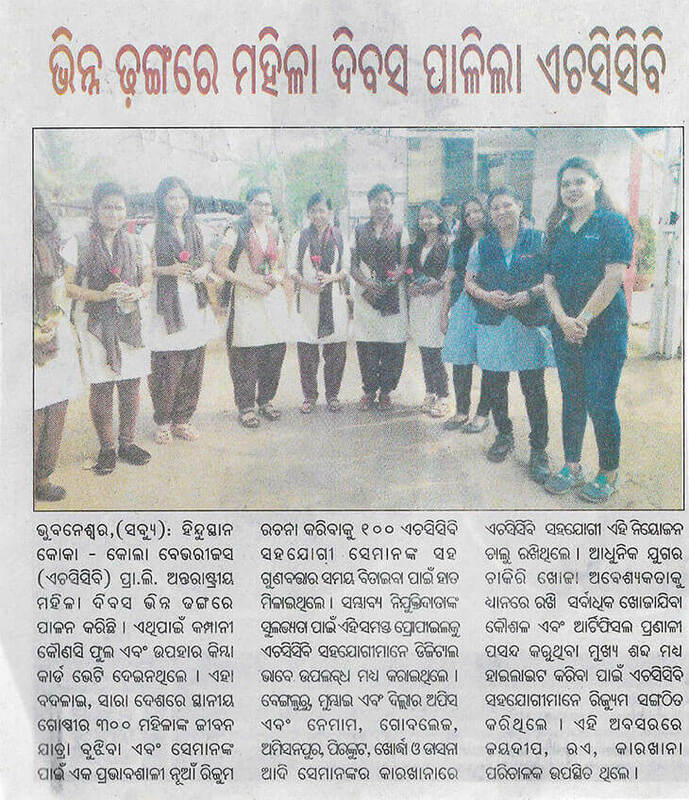 HCCB associates carried out the engagement at its offices in Bengaluru, Mumbai and Delhi offices and its factories at Nemam, Goblej, Ameenpur, Pirangut, Khurda and Dasna. 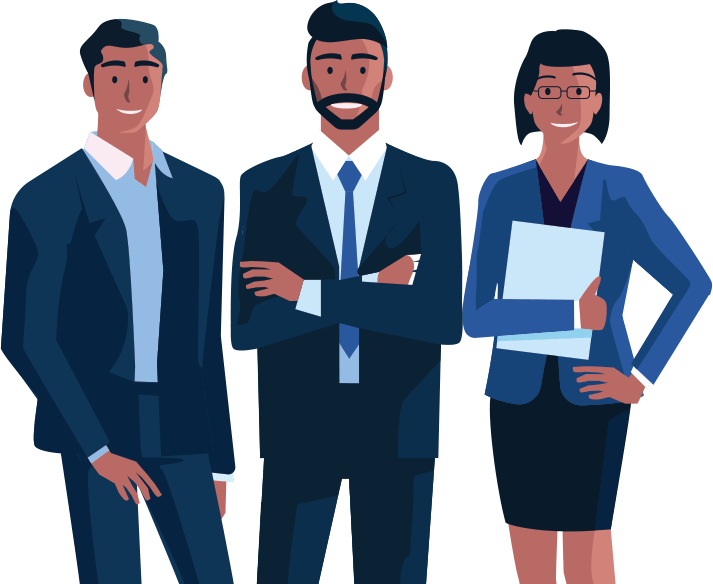 In keeping with the requirements of modern day job searches, HCCB associates curated the resumes to highlight the most searched skills and also keywords that Artificial Intelligence systems prefer. All this in a span of one-and-half hours! The profiles were also converted into additional local language of choice, of the ladies. To add to this, these resumes were made available on social platforms, meant for job searches and requisitions. 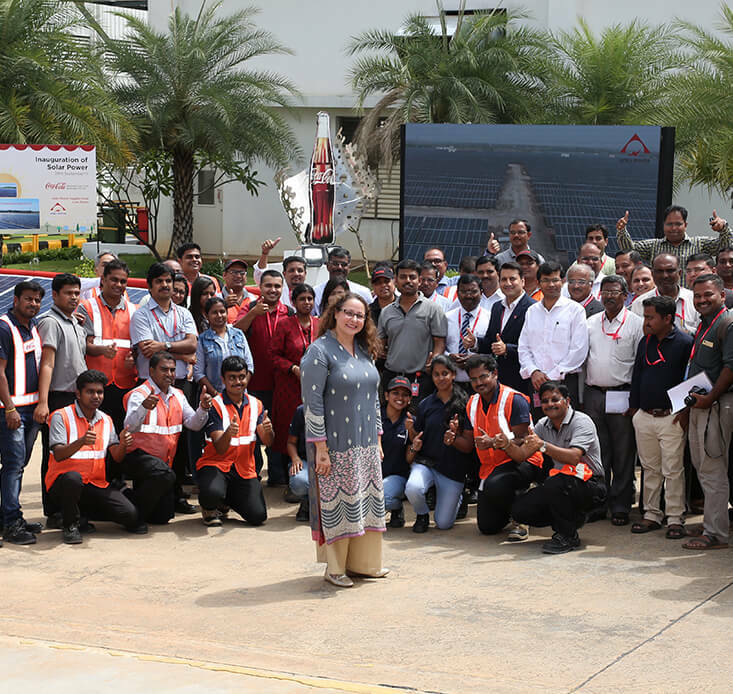 Aligned with the global International Women’s Day theme of #BalanceForBetter, HCCB’s unique initiative titled #InspiredByYOU had a series of activations through the day. The first half of the day was spent recognizing the efforts of HCCB associates, men and women, and their partners who contributed to their success in life. 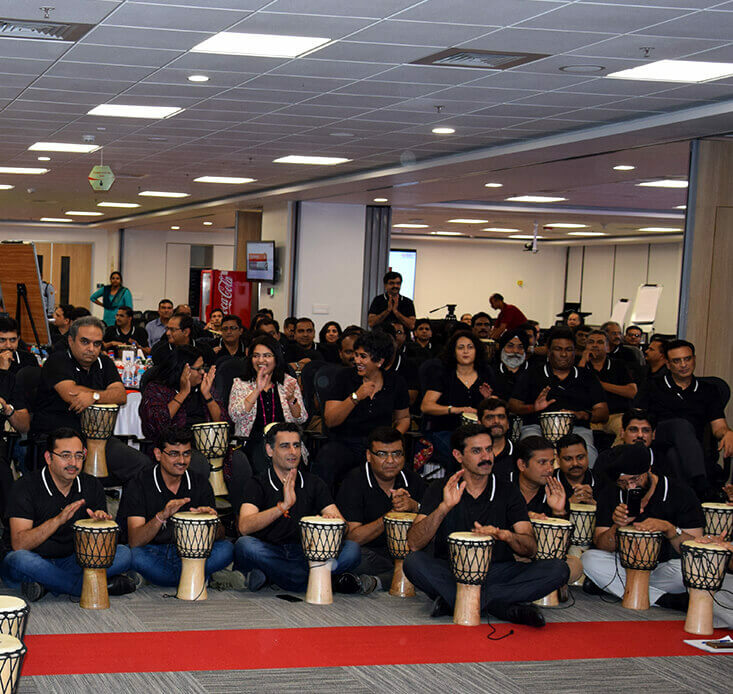 Panel discussions with company’s senior leadership team, quizzes around gender stereotypes, coaching workshops, etc were also held to set the tone for the day, which culminated with the bio-data creating session and fun activation. Hindustan Coca-Cola Beverages Pvt. Ltd is one of India’s largest FMCG manufacturing and distribution companies. It is responsible for the manufacture, package, sale, and distribution of beverages under the trademarks of The Coca-Cola Company. A network of 3,900 distributors, 250,000 farmers, 7,000 suppliers and over 2 million retail outlets distribute the high quality, great tasting beverages manufactured by Hindustan Coca-Cola Beverages. HCCB operates across 25 states in 493 districts. With 18 factories, HCCB manufactures and sells 55 + products in 9 different categories. Bengaluru, February 22, 2019: Hindustan Coca-Cola Beverages (HCCB) Pvt. Ltd. today announced that it has achieved 100% LED lighting at its second factory located at the Bidadi Industrial Area, in Bengaluru. Referred to as the HCCB Aranya factory, this is one of the newer greenfield sites of HCCB, built with the state of the art technology and latest machines. The factory achieved the distinction of being a 100% LED lighted factory over a short span of two months. The intervention will save 2.5 lakh KWH per annum, reducing 200 tons in carbon footprint. HCCB now meets 40% of its energy requirements across all factories through renewable and clean energy sources. The Aranya factory becomes HCCB’s fourth factory to have 100% LED lighting, after Vijayawada, Ameenpur and Siliguri. The project was implemented in phases by installing 1300 lights, replacing panel lights, high bay lights, flameproof lights, tube lights and high mast lights among others. In addition to being 100% LED lit, this factory also sources more than 60% of its power supply through solar energy under state open access policy. The factory also has a boiler, which runs on 100% CNG. The CNG supply to the factory is by GAIL. According to Ganesh G, Factory Manager, HCCB Aranya, “We are proud about the contribution that we will make to a sustainable and green ecosystem. This has been a great collaborative effort and I would like to thank all our partners and associates for their contribution. We are already looking at solar power as our primary energy source and use CNG for our boilers." Many HCCB factories procure solar energy under state open access policy, and Briquette/CNG fuel for their thermal energy requirements. All HCCB factories in Andhra Pradesh and Telangana have started using solar power for their primary energy requirements. The factory at Ameenpur has 75 per cent of its needs met by solar energy while the two others at Vijayawada and Srikalahasti have 50 per cent of their requirements met by solar power. The Company now meets 40% of its energy requirements across all factories through renewable energy sources. HCCB has taken several other initiatives like the adoption of briquettes - made out of agricultural waste like groundnuts and coconut shells - to power boilers. Installation of solar rooftops, adoption of energy efficient technology and greater investments in high-speed manufacturing lines, are some other examples. Ahmedabad, January 31, 2019: HCCB (Hindustan Coca-Cola Beverages), through various initiatives, has been continuously working towards creating a safe work environment for all its stakeholders, internal or external. 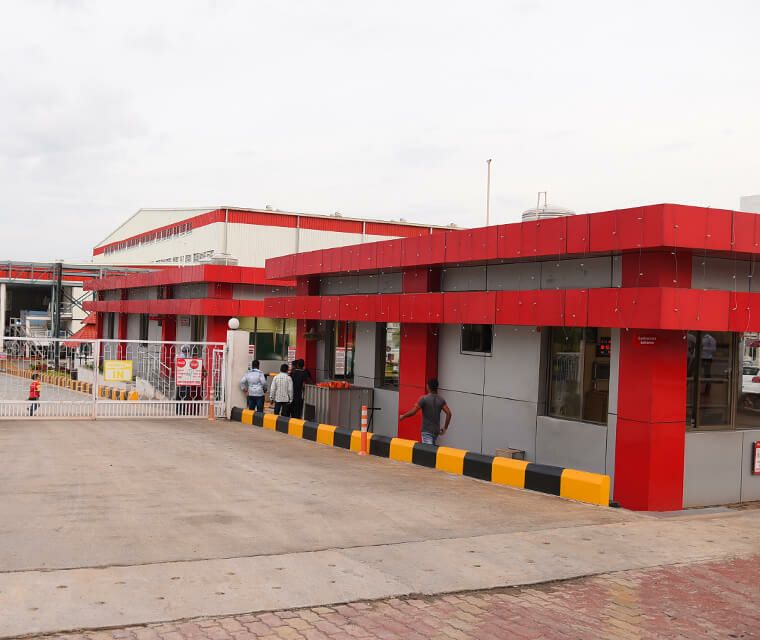 In line with this philosophy, HCCB has launched a state-of-the-art Integrated Driver Management Centre (DMC) and Driver Rest Facility at its Goblej factory on the outskirts of Ahmedabad. The new facility was launched by Dinesh Jadhav, Executive Director, Supply Chain, HCCB. HCCB's Driver Management Centre has been created with the single-minded focus of driver welfare and benefits, and with the hope that it positively contributes to the overall road safety and driver well-being in India. The state-of-the-art centre has a comprehensive set of facilities, which will enable drivers to have a safe and convenient driving experience. 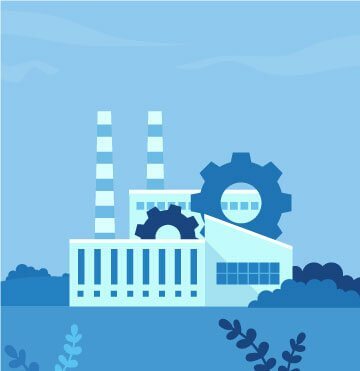 HCCB has 18 factories across the length and breadth of India and as one of the top FMCG companies, works closely with stakeholders across the entire manufacturing and distribution value chain. Our logistics and distribution partners along with the driver partners thus form an integral part of the HCCB ecosystem. 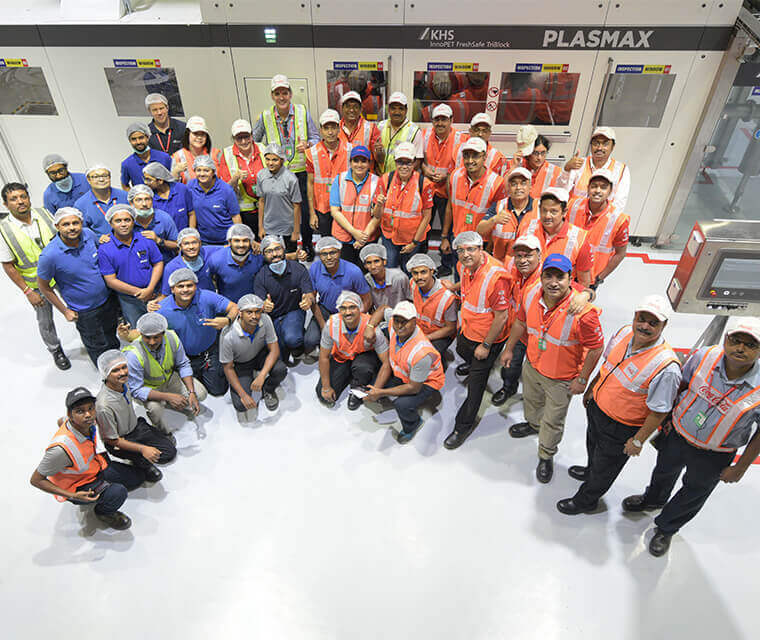 Dinesh Jadhav, Executive Director, Supply Chain, HCCB, said, Safety of our associates and all our partners is fundamental to the way to do business. We will continue our relentless pursuit of safety for everyone, in all possible ways. The new centre that we inaugurated and the host of activites that we have planned on the occasion of the upcoming Road Safety Week are only some steps in this direction. The new DMC kickstarts HCCB's preparations for the 30th National Road Safety Week which will be observed from Feb 4, 2019. HCCB has planned a host of activities to sensitise its associates and other stakeholders on the importance of observing road safety and demonstrate responsible behavior all the time. HCCB will organize training and safe driving sensitization sessions for its associates and sales representatives known as market growth representatives (MGRs), apart from holding safety quizzes, creating safety brand ambassadors covering all the seven business zones of the company, blood donation camps targeting more than 1000 associates, distribution of fliers with messages on road safety and other onground activations. Hindustan Coca-Cola Beverages Pvt. Ltd, is one of India's largest FMCG manufacturing and distribution companies. It is responsible for the manufacture, package, sale and distribution of beverages under the trademarks of The Coca-Cola Company. A network of 3,900 distributors, 250,000 farmers, 7000 suppliers and over 2 million retail outlets distribute the high quality, great tasting beverages manufactured by Hindustan Coca-Cola Beverages. HCCB operates across 25 states in 493 districts. With 18 factories, HCCB manufactures and sells 55 + products in 9 different categories. US vs India: What’s the difference in business strategy? © Hindustan Coca-Cola Beverages Pvt. Ltd. All Rights Reserved. Coca-Cola, Coke, Dynamic Ribbon, Contour Bottle, Sprite, Limca, Thums Up, Maaza, Fanta and Minute Maid are registered trademarks of The Coca-Cola Company.